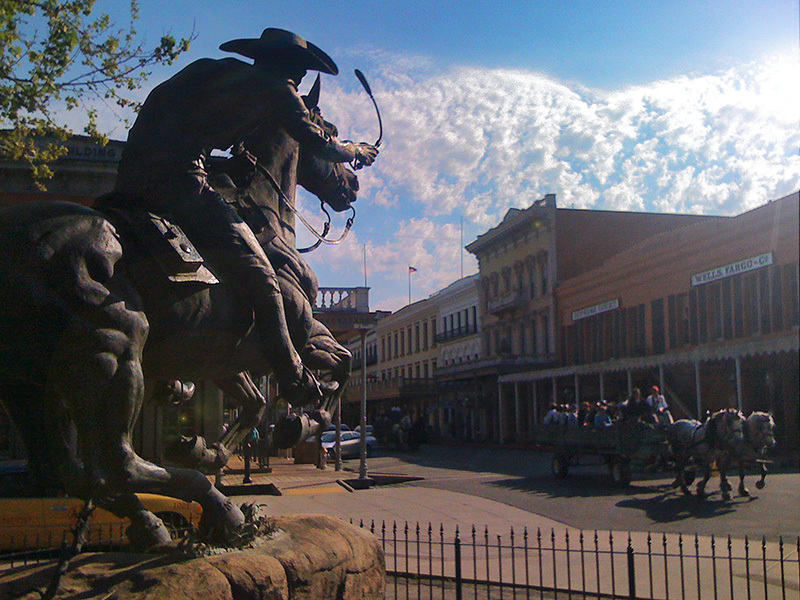 Pony Express National Historic Trail in Old Town Sacramento, California. The Pony Express service was contracted with the federal government to deliver mail on horseback – mail traveled from Missouri to California in ten days on horseback. During the short-lived service, April 1860 to October 1861, famous riders like “Buffalo Bill” Cody braved the Wild West and became instant legends. The first Pony Express rider left St. Joseph on April 3, 1860 and arrived ten days later in San Francisco. Concurrently, an eastbound Pony Express rider left San Francisco, arriving successfully in St. Joseph, Missouri. The Pony Express service ended just a year and a half later, in October 1861, after the new transcontinental telegraph was completed. More than 150 relay stations spread out across the American plains, from St. Joseph, Missouri to San Francisco, California, crossing mountains and deserts. Relaying along these small outposts, riders delivered mail in nearly every type of condition – blizzards and Indian attacks included. Today, the trail has many opportunities to discover more about a uniquely American story, including museums and reenactments along the wide open spaces of the original route.